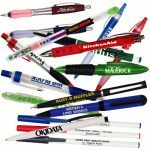 If you look in your stationary drawer at work, you’re most likely to find countless plastic company pens rolling around inside. You’ll grab one, realise it doesn’t even work and throw it away or back in the drawer. You won’t remember where they came from or even what the company does. And in the ever changing technological world of iPads and smart phones, who’s to say you even need a pen to jot down that memo? Even though marketing spend is on the rise, more companies are having to embrace new and innovative ways of promoting and launching their products to stand out from the crowd. The promotional products industry is moving on from useless and worn-out merchandise ideas like pens and mouse pads and welcoming in “a veritable fireworks of innovations” (Source: Marketingmag.co.nz article from APPA.com.au). Clever marketers are realising that quality, exclusivity and sustainability are what really count. Environmentally friendly products have come a long way in the last few years and are now considered a trendy way to go green. They extend beyond hemp tote bags and recycled notebooks to include travel mugs, photo frames and cooler bags. Combined with the newest technology; materials made of bamboo, cotton, jute and even corn starch create renewable and reusable products that not only care for the environment, but show that businesses care too. While the move to go green may seem simple or unsophisticated, the quality of these products speaks for itself. The dual nature of the materials is that they are both naturally durable as well as biodegradable. This satisfies the increasing demand for retail quality products that still have heart. Best of all, the move to use eco-friendly products doesn’t compromise relevance or style. Neither does it discriminate. 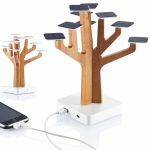 B dynamic’s eco products range from herb plants in zinc pots (for the lawyers who secretly pretend to be master chef’s at home), to a solar desk tree that guarantees your iPhone will never run out of juice when you’re video conferencing. Promotional products are used not only to increase sales and brand awareness, but they also reflect back on the business that chooses them. Ultimately, the value of the product is up to the client. So, when deciding which direction to go for your next campaign, ask yourself this. Are my clients more likely to use and remember a plastic click pen that hides in their desk or an engraved bamboo photo frame of their family that sits above it?